The long-term goal of Dr. Felder's research is to identify approaches that address racial/ethnic and socioeconomic disparities in health, with an emphasis on disadvantaged populations diagnosed with cancer. 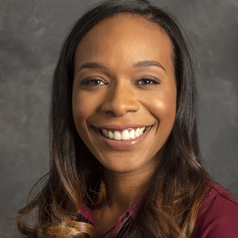 She also has strong research interests in the mentoring and training of junior faculty from underrepresented backgrounds in biomedical science. Dr. Felder received her BA in sociology, with a minor in Spanish, from Wake Forest University in Winston-Salem, NC in 2001. She received her Master of Social Work from the University of Michigan-Ann Arbor, with specializations in social policy and evaluation (practice method concentration) and community and social systems (practice area concentration) in 2002. In 2010, she graduated with a PhD in behavioral sciences, with minors in epidemiology and health policy, from the University of Texas (UT) School of Public Health in Houston.